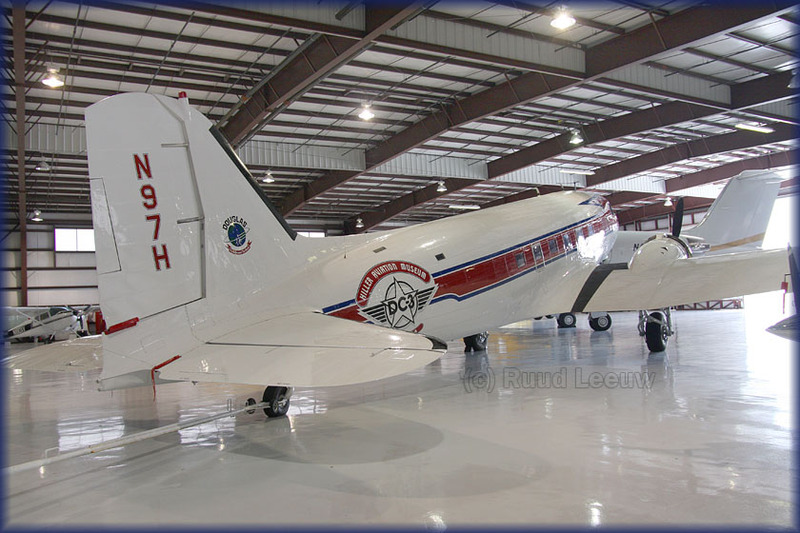 Upon inquiries about DC-3 N97H I stumbled into Dave Ormond and he told me that N97H (C-47B, c/n 16865/33613) was now owned (registered 17May05) and flown by Stephen Hiller of the Hiller Aviation Museum (located in San Carlos, about 6 miles south of SFO). 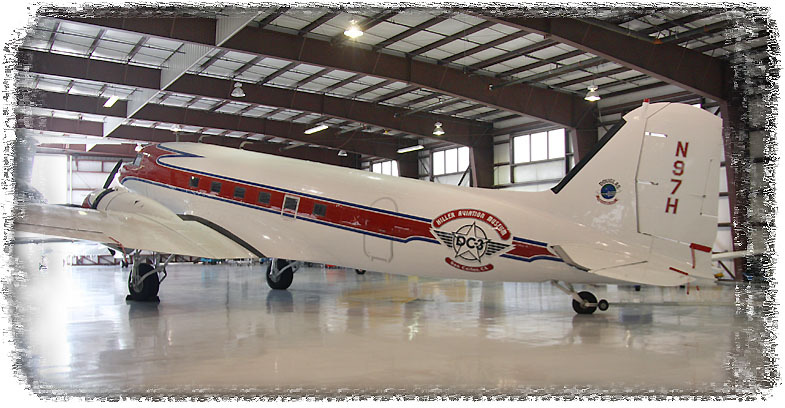 This DC-3 is one of the former Otis Spunkmeyer Bay tour airplanes. 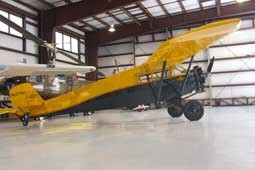 Dave warned me that the Bud Field hangar was not open to the public, but mentioning his name opened the right doors... Thanks Dave !! 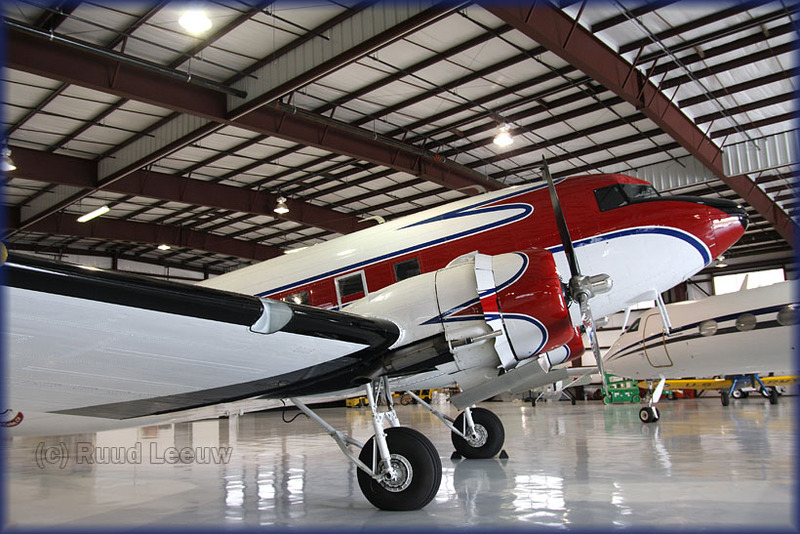 Besides the immaculate appearance of the DC-3, I must admit I never saw such a clean hangar! 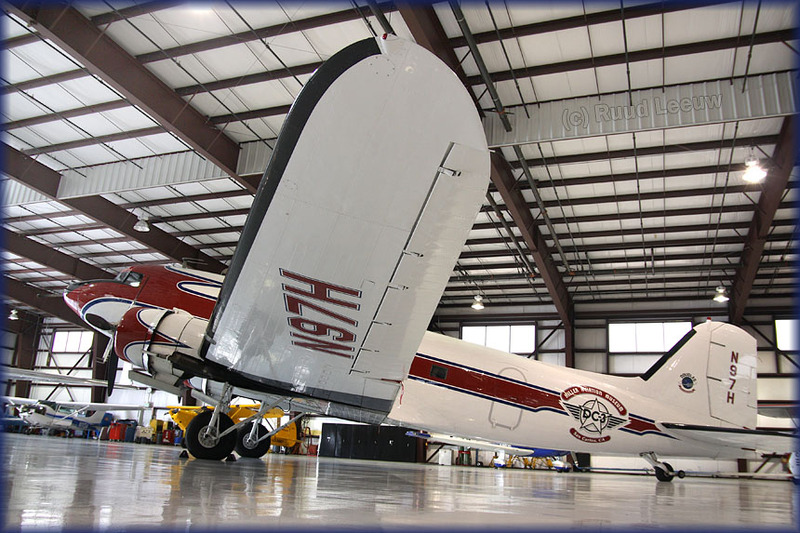 Let's do a walkround on this DC-3. Construction number 16865, due duplication reserialled to 33613. Delivered to US Army Air Force with military serial 44-77281 on 07Jul45 and handed over to the Reconstruction Finance Corporation (RFC) on 24Feb46. 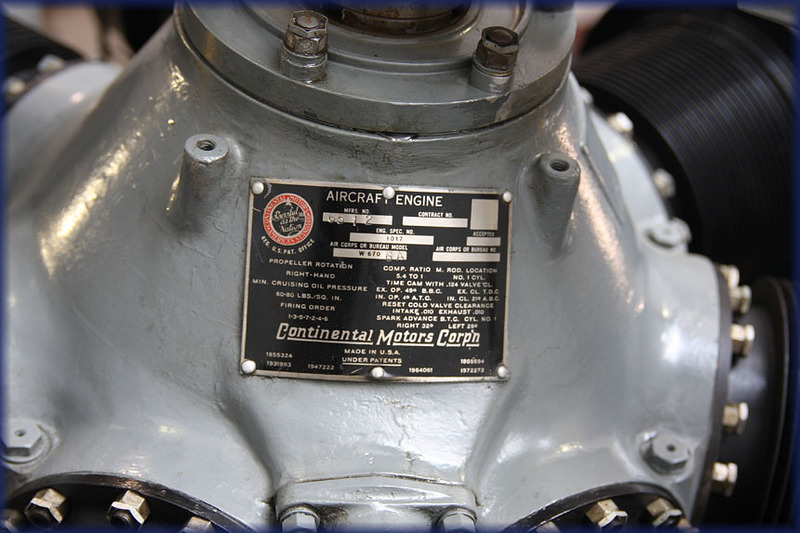 Registered as NC53480 for Raymond J.Wilson of Los Angeles,CA who purchased it on 11Apr46. 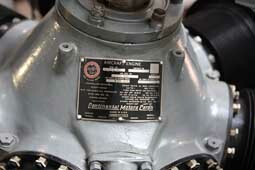 Almost immediately reregistered as NC63288 on 29Apr46, whilst the Hancock College of Aeronautics (Santa Clara,CA) had become owner on 18Apr46. Only a few months later, on 18Dec46, La Brea Securities (Los Angeles) became the new owner. Next was the University of Southern California for its College of Aeronautics, as per 04Feb47. 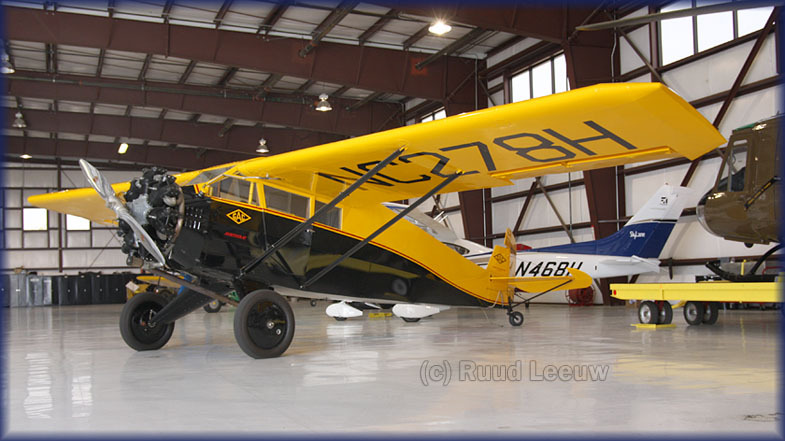 And the Humble Oil & Refining Company (Houston,TX) took ownership in Nov53 and reregistered this Gooney Bird to N97H on 05Dec56. After a period of stability in ownership, on 09Feb65 ownership changed again, to Butterworth System Inc., of Bayonne,NJ. But Humble Oil became owner again 25May65, thus returning to Texas. J.W. Harrison and W.H. Wheeler of Tyler,TX bought it on 22Oct67 and the ownership was revised on 13May74 when W.H. Wheeler became the single owner. While 5 years later, 03Apr79, B Inc of Dallas,TX became the new owner. Home remained in Texas when on 05Feb80 N79H became registered to Fort Worth Apache Corporation of Euless,TX. AFS Leasing of Bluefield,WV bought it on 06Dec83 and N97H was reported operating for 'Sentimental Journeys'. 01Feb88 it was registered to Victory Lap (San Leandro,CA) while only a few days later, 10Feb88, the registry was changed to Bill Celli Leasing of Lafayette,CA. The Otis Spunkmeyer Company bought it on 02Sep92, while still operating it as 'Sentimental Journeys'. On 04Oct99 the owner was recorded as Arthur J. Gallagher (Itasca,IL) and this changed again on 13Jan2000 to William B. Field of Hayward,CA. 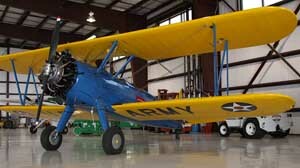 This was revised to Bud Field Vintage Air Museum of Hayward,CA. 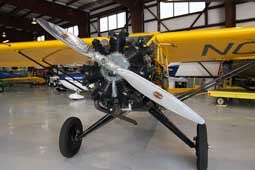 Since 17May05 it is owned by Stephen Hiller of Hayward, but N97H still has its home in the Bud Field Aviation hangar. 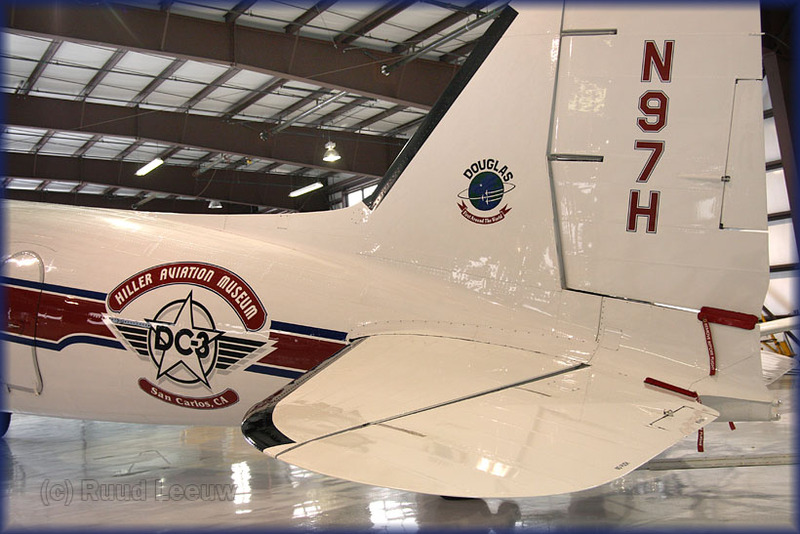 "I came across your webpage regarding DC-3 N97H, which we operated during 1983-85. I was Chief Flight Attendant. Charles C. Quarles, D.D.S., F.A.G.D. UPDATE: N97H found in 2013 a new career.... in Russia! It arrived in July in Moscow wearing both tailnumbers N97H and RA-2059G, plus a large sticker with "Barsov Aviation Museum, Surgut, Yugra". Surgut seems to be located in Siberia! I decided to have a look 'round at leasure, as I had not prepared myself to much else besides N97H; the other aircraft proved to be very interesting too. 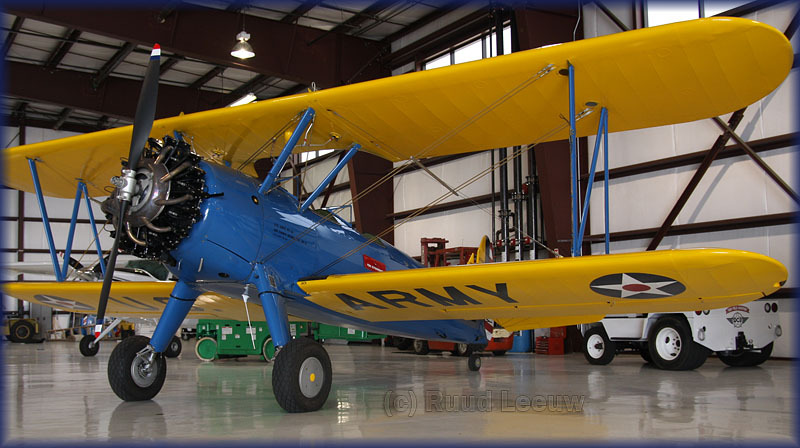 This is a Boeing-Stearman 75 Kaydet (PT-13). Its present registration is N75001, while it carried previously 36-002 (Army Air Corps), N53226 and N77001. NC278H has c/n 20 . 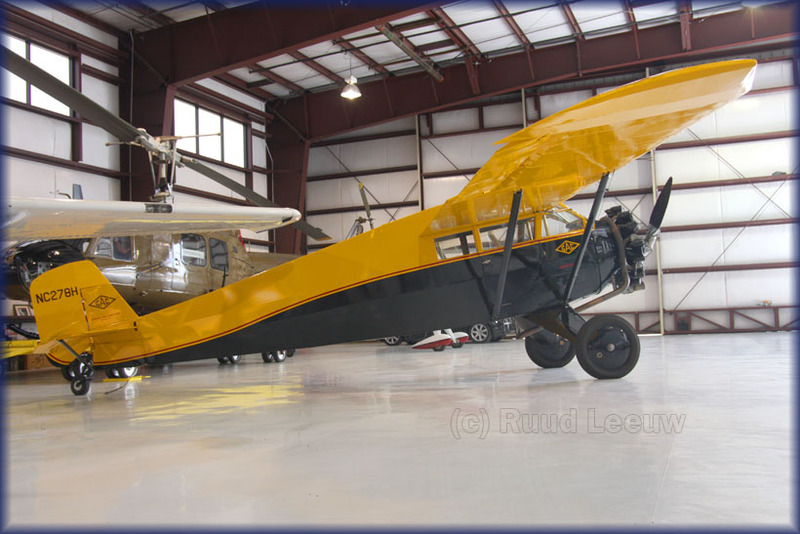 "The Aristocraft 3-seat high wing monoplane was built in Buffalo in 1930 (found 1929 elswhere on the internet -Webmaster). About 40 were produced and the sole survivor was restored at Blakesburg, Iowa by Bob Taylor and his sons." 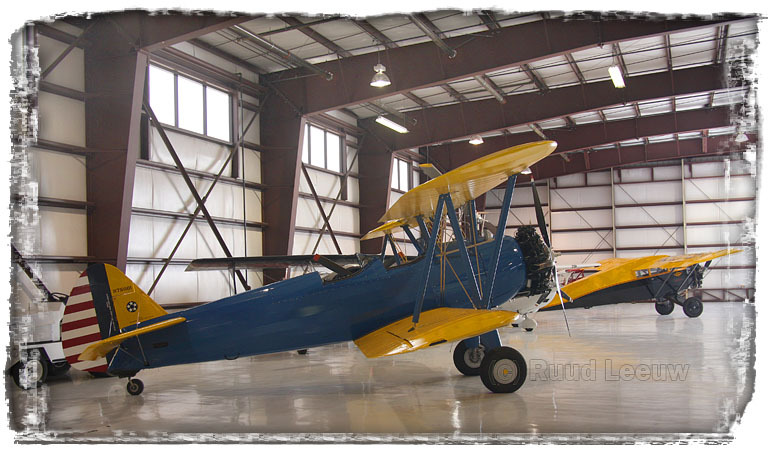 Dennis Goodrich pointed out: "Blakesburg is where the Antique Aviation Association is HQ'd." 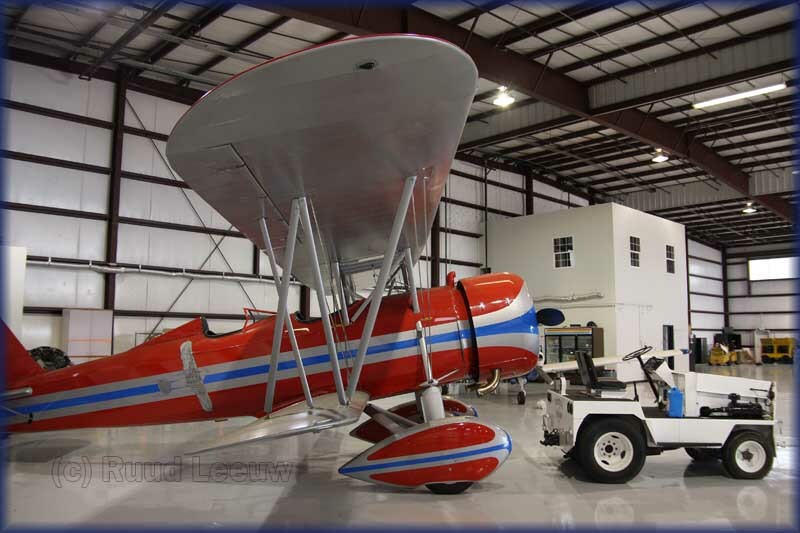 "Bud Field has acquired a collection of vintage aircraft which are currently based at a number of airfields in the Bay area. He plans to construct a hangar at Hayward Airport and open it to the public. Forty Stearman 4s were built in the late 1920s and early 1930s. 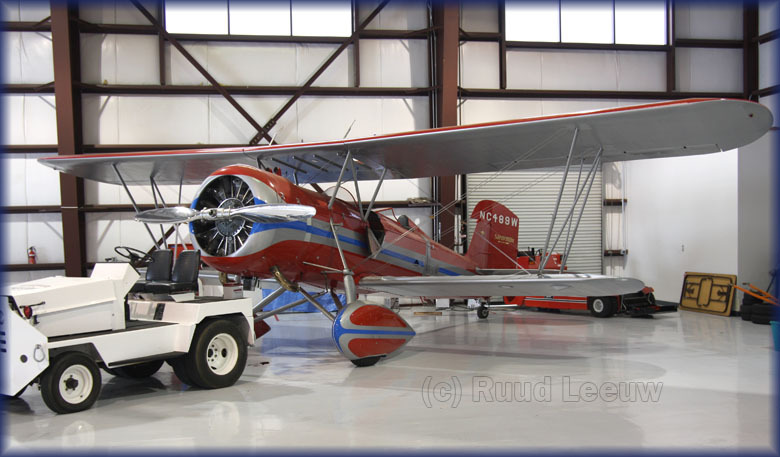 The 4CM-1 was a single seater designed for mail carrying." This may have been the hangar mentioned above, but I got the impression it was in use also for other aircraft (executive jets) and I saw no signs of it being a museum (yet). 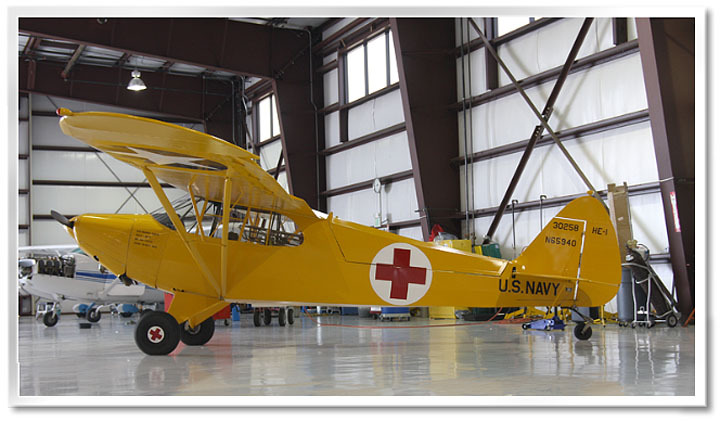 Depending on the sources, 36 to 38 Stearman 4 were produced. Nowadays, 12 can be found on the N-register, all of them in private hands. Of theses 5 are flyable, while the others are in need of TLC at various levels. This is still a pretty healthy population for a little known type of airplane! Thanks to Dave for showing the way and Brendan for allowing me in.